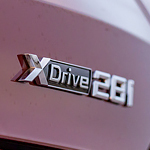 The X Series vehicles are powerful and sporty, just as you would expect from BMW. What sets these apart from the rest are their shape and cargo capabilities. The vehicles that we have at Grand Blanc Motorcars range from the more compact X1 to the seven-seater X7. Because the back seats can fold down in a 40/20/40 configuration, you can get additional room for gear, and you can quickly change things up whenever you need to. In fact, at BMW, these SUVs are called Sports Activity Vehicles® or Sports Activity Coupes® because they're so practical. In the X Series, you can get up to 456 horsepower, and you have some options to choose from. You can take advantage of a dynamic engine or opt for the eDrive technology for greater efficiency. You can also decide between all-wheel or rear-wheel drive.